All VMs restored with Instant VM Recovery are displayed in the Home view, under the Instant Recovery node. In the inventory pane, click the Instant Recovery node. Right-click the VM in the working area and select Properties. Alternatively, you can open the History view, select the Instant Recovery node under Restore in the inventory pane and double-click the necessary instant VM restore session. In the working area, right-click the VM and select Migrate to production. 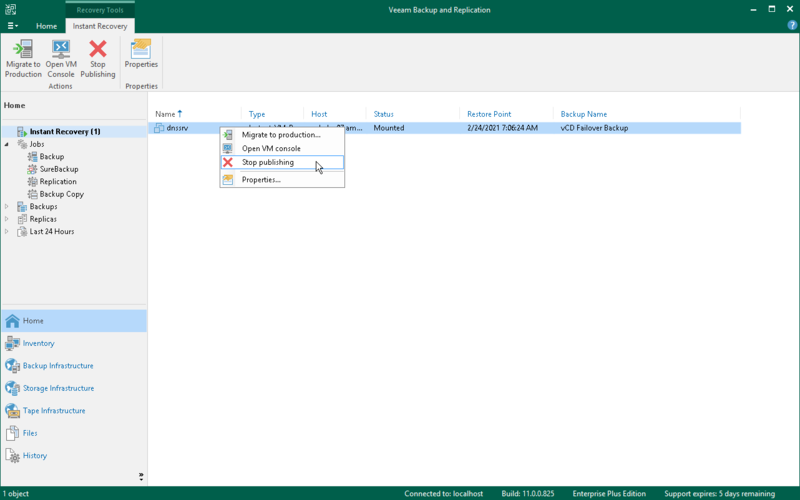 Veeam Backup & Replication will launch the Quick Migration wizard. During migration, Veeam Backup & Replication will restore the VM from the backup file and additionally move all changes that were made while the VM was running from the backup in the Instant Recovery mode. When you pass though the Quick Migration wizard, enable the Delete source VM files upon successful migration option. Veeam Backup & Replication will restore the VM to production and automatically stop the Instant VM recovery session. If you do not enable this option, the Instant VM recovery session will still be running, and you will need to unpublish the recovered VM manually. If you have disabled the Delete source VM files upon successful migration option in the Quick Migration settings, you must unpublish the VM manually. After you unpublish the VM, the Instant Recovery session will end and the recovered VM will be unmounted from the vPower NFS server. The migrated VM will remain on the production environment. In the working area, right-click the VM and select Stop publishing. After the VM has been published from the backup, you can open the VM console directly from Veeam Backup & Replication. To do this, in the working area right-click the VM and select Open VM Console.